Should police intervene on the Internet? Some acts of extreme violence such as Virginia Tech in the United States, Dawson's College in Montreal and the recent deadly events in Finland reintroduce the debate on a potential necessary control over the Net. Are these atrocities asserted trough the web by their young profiled author have been enhanced by the easy free expression access that the new media provides? And, on another hand, does might be possible to insure a legislative control over the Internet? The problem is perhaps the transnational characteristic of the net; it defines itself as a global village that doesn't fold to frontiers. Another obstacle is undoubtedly the fact that the web is always described as a free expression platform. However, we have to create either reinforce world eye keepers, I mean these international governorships which would really legislate potential violence's acts. But, at first, we must define this legislation; on which criterion these new government authorities would work! 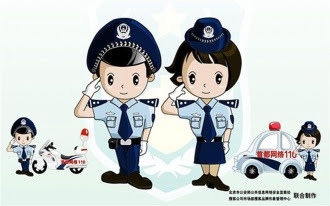 I think that this problem is an international one because of the universality of internet: for example, Chinese authorities are to send two virtual police officers to patrol the internet, in a bid to combat "illicit activities", state media has reported. The animated figures, a man and a woman, will appear on users' screens every 30 minutes "to remind them of internet security", China Daily said.This is because the Chinese government censors all internet and media content. This process blocks content it deems politically or morally threatening, but some users have found ways to circumvent government controls. So i think hackers will ever be more efficient than police on this issue….. Even if "the virtual police officers would protect "netizens" from harm"…. I think if police were on internet maybe we could have less murders but as i said, people will find another way to broadcast their anger! Internet is a global village were there isn't border so if police has a look on what is announced on it, i think it will modify the status of this media! Everybody is a policeman on the web. Have you ever seen someone criticizing someone else or gossiping in front of a screen showing a Facebook page? As far as I am concerned, I think that in a certain way, there is a sort of general control by the opinion on the web. That is why I am against a police on the net: there can be a kind of natural order around interpersonnal relations. But in what concerns problems of hacking or pedophilia, for example, not only the moral is at stake: there are concrete crimes, and that is what a police must condemn. To sum up, I think that there are spontaneous punishments against people who break relationnal laws, on a site like hatebook.com, for example. Of course, it works only if the people who have gossiped -and are punished by gossips- are not anonymous. If they are, they can change their cheatname. But the Internet is a way to commit concrete crimes: that's why a police must act in those cases. There is one horrible threat on Internet that no one ever speak about. It can lead to our poorest instincts. It can lead anyone to lose ones self esteem, ones joy of living, ones happiness. It touches every member of the family. Let's take a french example. Je vous sollicite car une petite fille de 9 mois doit être sauvée. Noélie est atteinte d'une leucémie rare. cette information.D'avance merci à tous . In this example, nothing too terrible. Who hasn't ever got an email from a potential dictator who begs you to give him money in order to establish a democracy? Who hasn't ever feared the sum of pain that a chain letter you refuse to forward can bring you ? and who guarantee me a return on investisment if I give him a substantial donation. Well. Imagine if it were my mom who got this mail. You know the mothers, they are polite, nice, and they want to help democracy, especially when they have a subscription for Telerama. At this time, she wouldn't be able to afford a coat for the winter. And she would freeze, alone. As you read, it can be really awfull, and lead everyone to the foolishest acts. I hope this will save lives. I hope every will live in peace in the world, without dirty and filthy jokes on dead people and democracy. I can't stand it anymore. In novembre 2007, a finnish eighteen-year old student shot 8 people in his high-school after publishing a video on youtube called "Jokela high-school massacre". “I am prepared to fight and die for my cause,” he wrote in a post, “I, as a natural selector, will eliminate all who I see unfit, disgraces of human race and failures of natural selection.” Couldn't be clearer. Question is: coud this kind of tragedy be avoided by a closer surveillance of video sharing webcasts (such as youtube or dailymotion for instance) or social networks? As there are more and more e-platforms allowing to share videos, photos, personal infos and news, it is both crucial and increasingly difficult to hunt down actual harmful users. So where is the limit?